Items shown below are some of the collectibles pieces we offer for your fundraising event. We will help you select the perfect items to maximize your fundraising efforts. Love this St Louis Cardinals Rally Cat bobblehead! This is the 2nd release of Rally Cat bobbleheads from the Bobblehead Hall of Fame away uniform. This will make a great addition to anyone's bobblehead collection! Boxed Brayden Schenn autographed game issued pucks autographed in silver pen. Beckett authenticated. 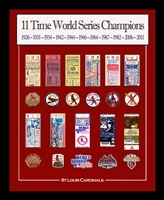 Authenticated by Beckett Everyone loves this 16x20" print of the St Louis Cardinals World Series replica tickets and patches representing each of the 11 World Series they have won. We frame this in black moulding and it is ready to hang with a sturdy wire hanger included. This unique Stan Musial item will look great in your home or office! Overall size is 13x21 with frame. Includes autographed card by Stan the Man, COA from Stan Musial Incorporated and highlighted with a cutout of the St Louis Arch to give it a finishing touch. Framed behind UV glass for extra protection of your collectible. ITEMS SHOWN ABOVE ARE SOME OF THE COLLECTIBLE PIECES WE OFFER FOR YOUR FUNDRAISING EVENT. WE WILL HELP YOU SELECT THE PERFECT ITEM TO MAXIMIZE YOUR FUNDRAISING EFFORTS.